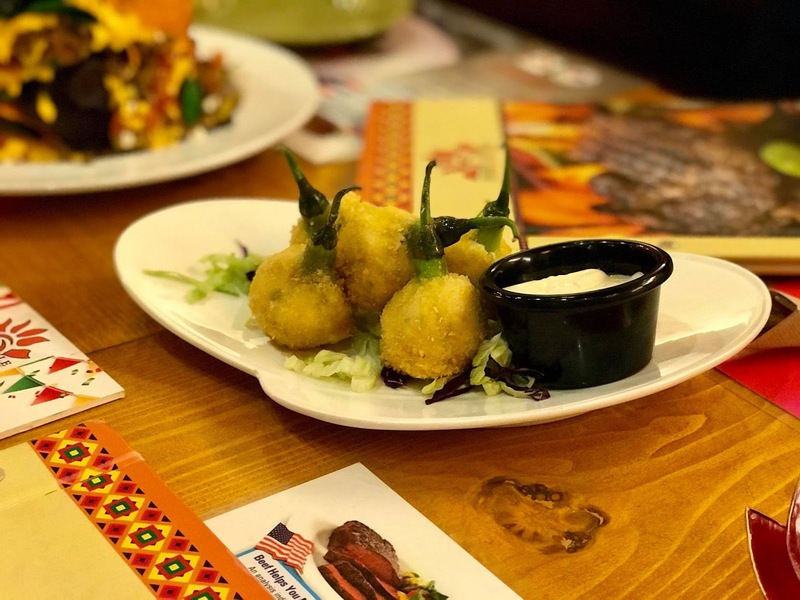 If you want to try authentic Texas-Mexican dishes, you got to try this resto! 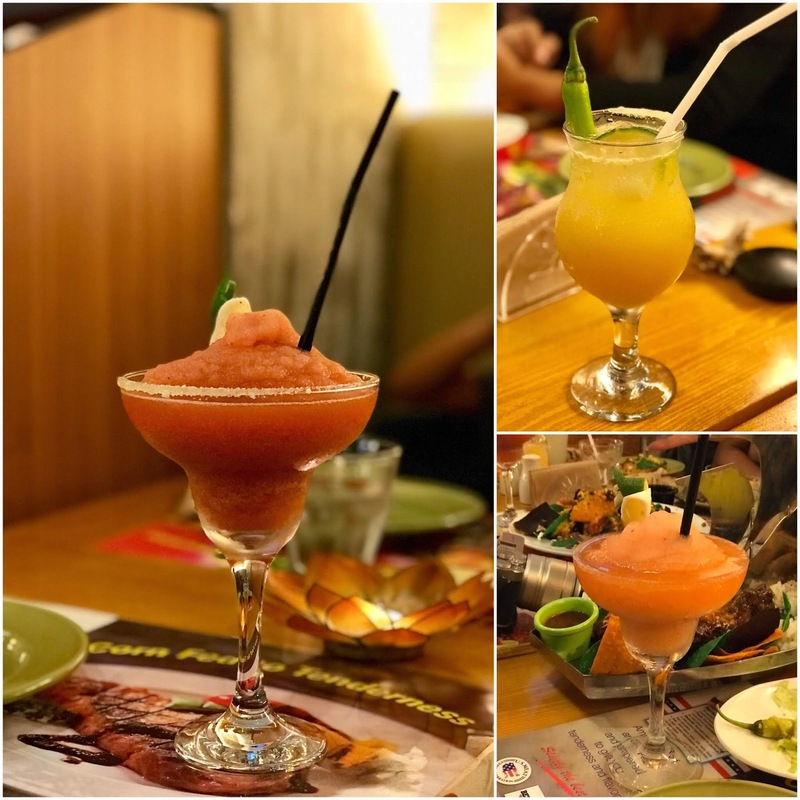 It's a hidden gem at Newport Mall in Resorts World Manila~ if you'll ask me. It has great ambiance, good music, and good food. 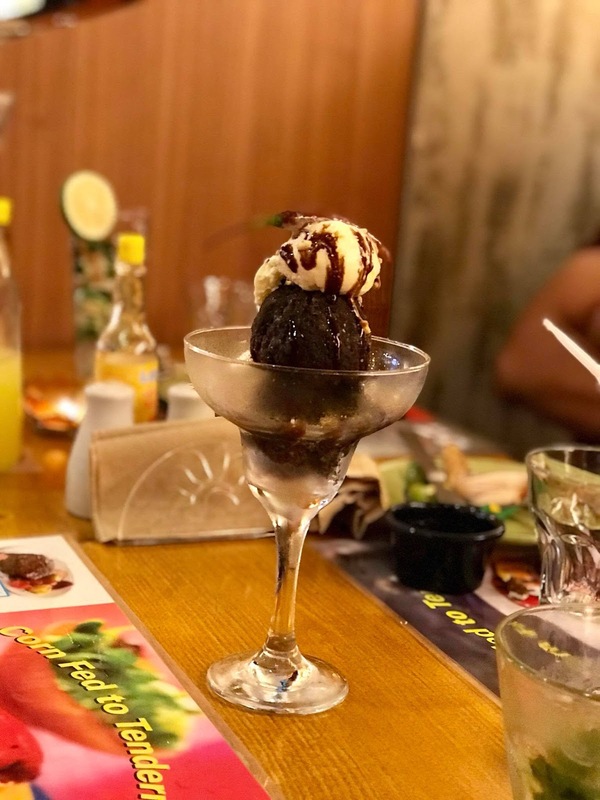 I was invited by a friend and we dined there exactly one month ago as I write this review. Pero sabi nga nila, — it's better late than neva'! 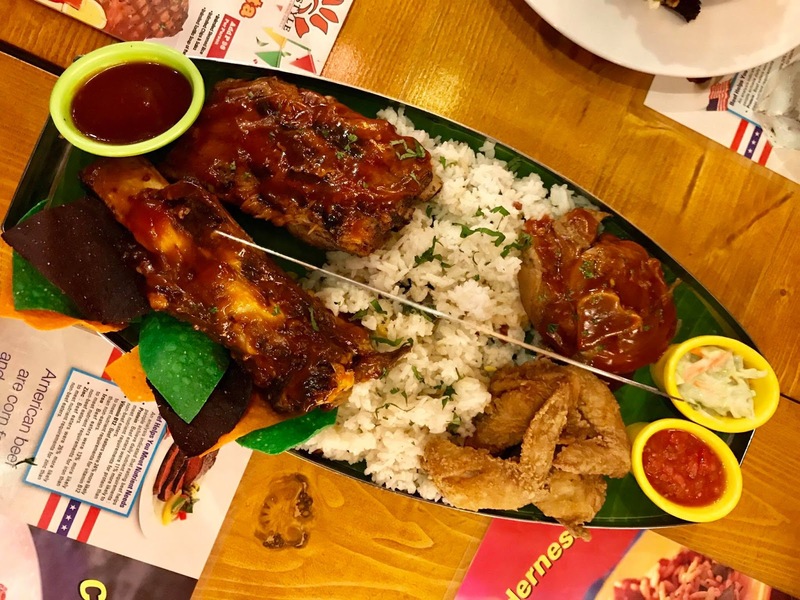 Oh and I was actually in the middle of a fitness challenge at the time when we dined-in at Fiery Style so just imagine my "pagpipigil" when the variety of food was served on our table. haha! Fiery Style Newport's location is located at the back, as in "sa likod" kaya if you are not too familiar at Newport Mall, you'll have some difficulty in finding it coz' it's not too easy to spot. But there are signs naman on the 2nd-floor dining area of the mall and syempre, you could always ask diba. But to help you out and to make it easier, if you see Wolfgang and Starbucks, it means malapit ka na (wink, wink!) — Fiery Style is actually just adjacent to Starbucks. Look at that Fiery Nachos! With a very colorful presentation, it was served warm, really crunchy with a hint of sweet and spicy. This is actually just one of our orders that made me ohhhhh so guilty. So, yup, there's more! haha! Aside that it's oozing with cheese, the generous amount of BBQ pulled pork is the bomb!!! Sarrrrrap sobra! I swear, ang dami kong nakain! You guys just got to try it out and I tell you, you'll get more than what you paid for! It's one of the best in town. 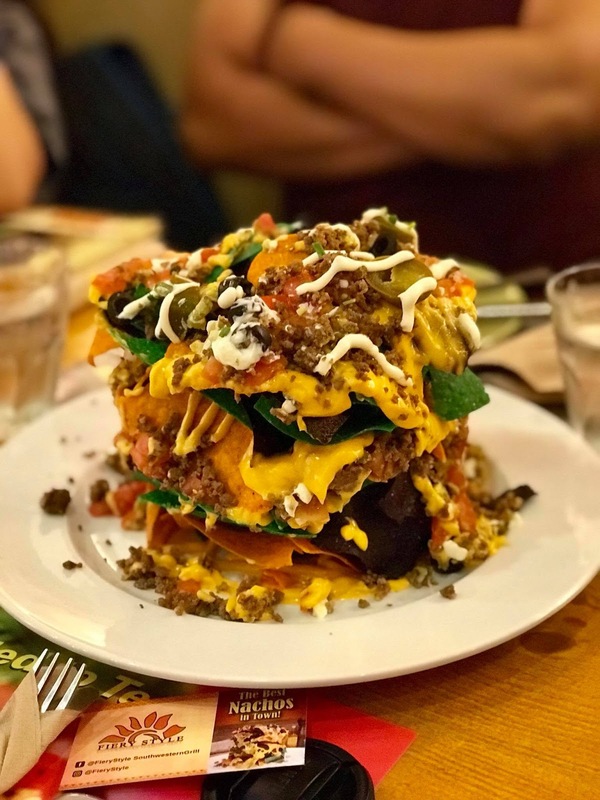 It has a generous amount of corn chips and your choice of either grilled Jalapeño-limed chicken, Mexican chili beef or BBQ pulled pork as toppings. 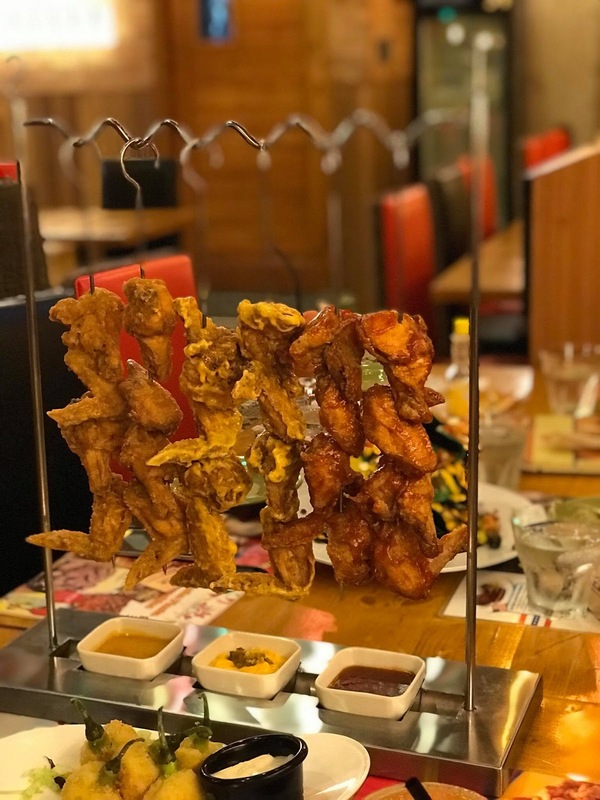 Fiery Style offers different platter sets to feed your hungry mood. 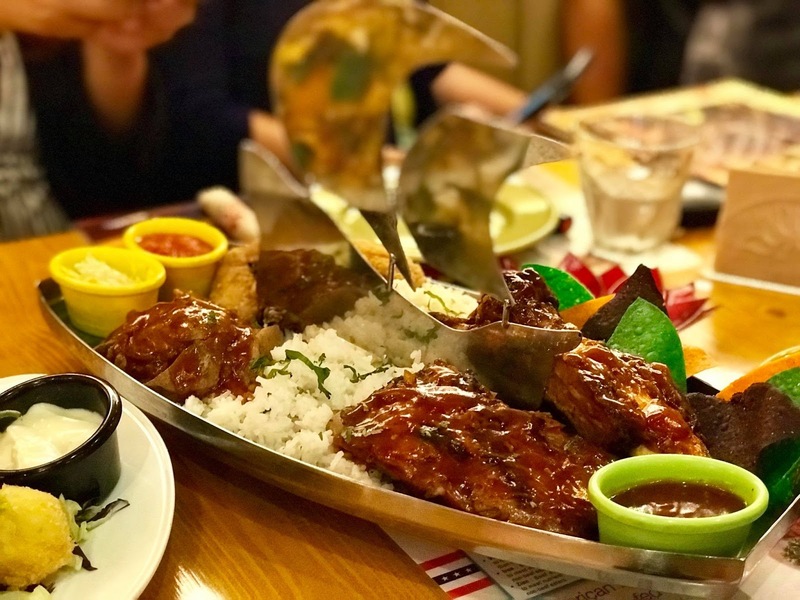 Fiery Style Galleon of Bones is a ship of BBQ slab ribs, chicken wings and meaty pork hammers served with Southwest Chips, choice of Fiery rice, coleslaw and Texan-style bbq sauce. The fork-tender beef BBQ slab ribs were tasty. 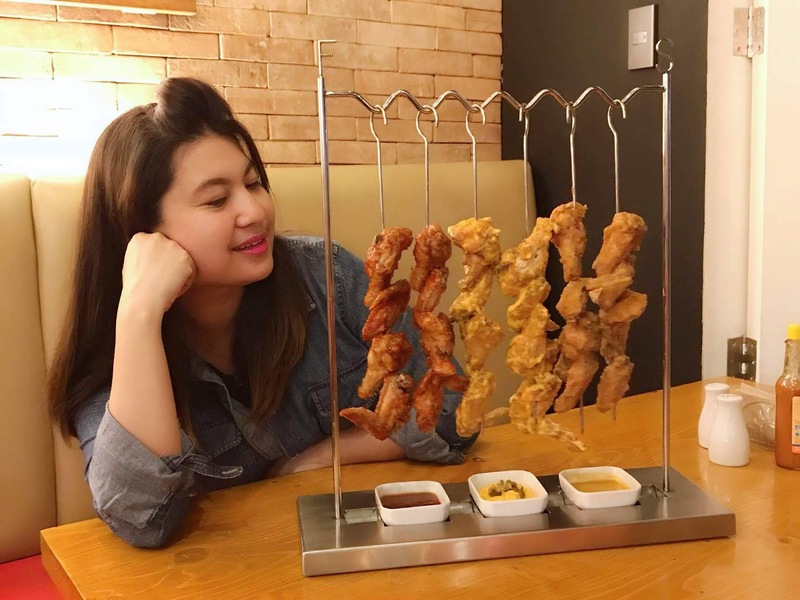 The serving of one platter is actually heavy and is good for 4-5 persons already. My gaaaad. This is my fave. Lord of the Wings has a total of 24 chicken wings~ 8 of each are topped with 3 different flavors: Nacho Cheese Sauce & Bacon, Hot Sauce & Jalapenos, and Texan BBQ. 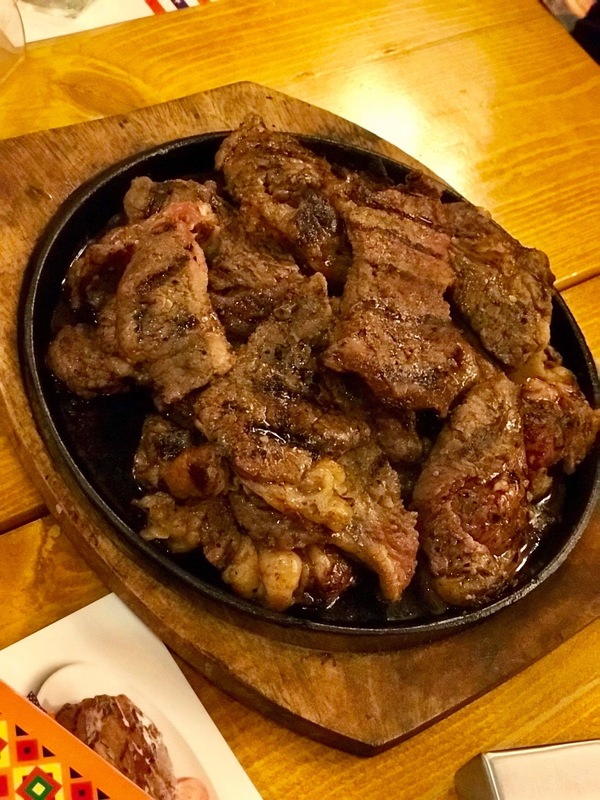 This is one-kilo of sizzling Rump Steak served with their very own Fiery gravy sauce. I'm very particular when it comes to steak and this one didn't disappoint. It's not that matigas, nor malambot, somewhere in the middle lang kaya with its price of only 1000 + pesos, this one is super sulit na. Trust me, I've had so many experiences with steak kaya I promised myself that one of these days, I shall come back with the husband so he could try this one. My husband kasi is a superrrr steak lover! As in his eyes are "nag ha-hart hart" everytime he see steak. 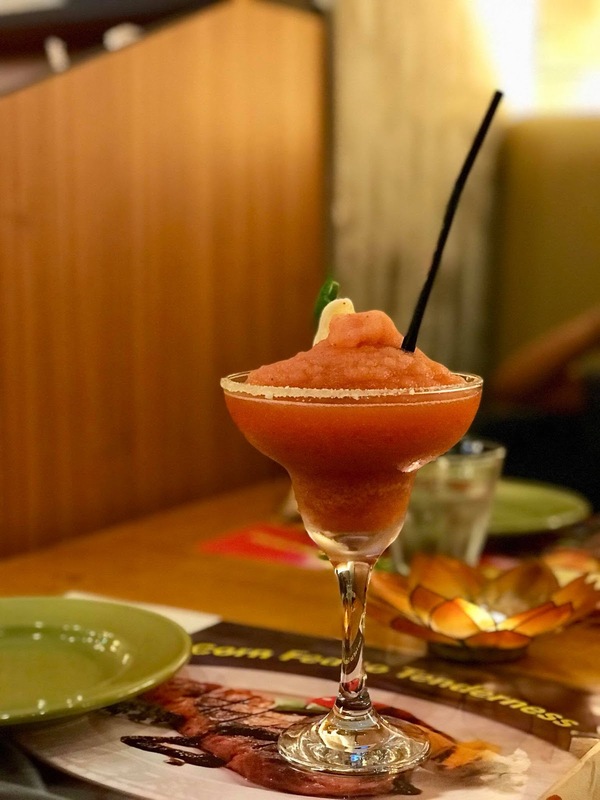 Margarita's, Mojito's, Fiery Paloma - which are all bottomless -- yup, bottomless guys, so if you want to 'walwal' and are looking for a not so expensive place to drink - this resto is for you. 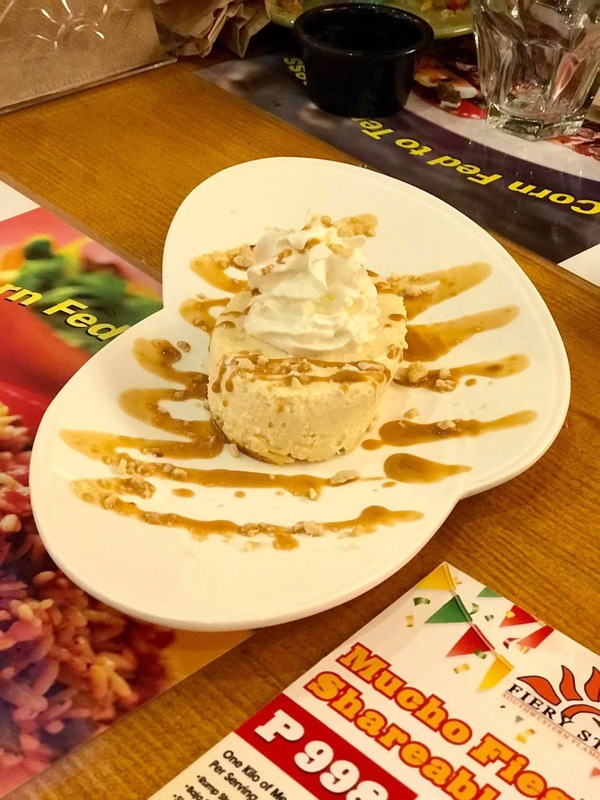 Sabi nga nila, a meal is not complete without a dessert! We had Cheesecake and Chili Choco fudge. I have no words for their Chili Choco fudge. It's a must try! The service crews are courteous and attentive to customers. Kudos to team Fiery Style Newport! As I've said, this is my first time to dine at Fiery Style and I am a satisfied first timer. I'm a lover of anything spicy so I would recommend this place. Oh, and they also have a branch in Mall of Asia and Festival Mall in Alabang. Go dine and try it yourself.